At C&M Tile and Granites, we invite your ideas and suggestions. We are ready to assist you with all of your interior and exterior projects from kitchen countertops, tabletops, floor tiles, bath surrounds, windowsills, custom finishes, walkways, driveways and more. Our scope of work includes interior design, supply of all materials, field measuring and installation services. We thoroughly enjoy the opportunity to work with our customers in creating an environment that provides everlasting beauty, functionality and style. A design professional will meet with you to discuss your new or remodelling project. We discuss the details surrounding the project, style and colour specifications, functionality of the space, and budget. We recommend that our clients bring in either a blueprint, drawing or photo so we can provide as many answers as possible. Based on the client's unique style and budget constraints, we recommend material options and break down pricing based on material selection. At this time, we also schedule field measurements, so we can provide an accurate quote. Our experienced craftsmen will come to your location and take any necessary measurements, while checking levels of surfaces, getting undermount templates, over hangs on high bars, radius corners, etc. We are very thorough in our measurements and field assessment, to ensure accurate estimates when quoting. Based on the field measurements and material selection, we provide an estimate of total project costs. Customers are required to sign off on the estimation before the fabrication or installation process has been implemented. Templates are laid on the selected material slab, and the cutting process begins. Edges are machine fabricated and the material is polished. All pieces are cleaned and sealed, as required. 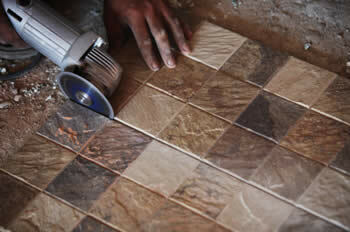 Our installation team will install your new stone or tile, ensuring quality control and customer satisfaction. © 2019 C and M Tile and Granites, All rights reserved.